Sapling’s master clocks have always been packed with features, but we’ve surpassed our previous efforts with our new SMA Series Master Clocks. 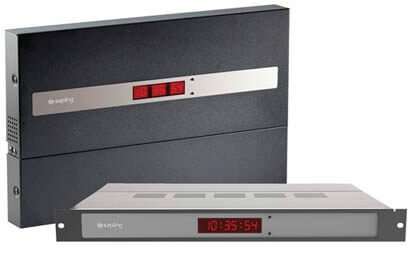 The SMA Series master clocks come with a plethora of standard features such as an (S)NTP input, interfacing with other systems and Daylight Saving Time. Also included is a fully functional web interface that allows you to program the master clock from any Internet connection. Each master clock has many optional features that are offered a la carte so you can buy the features you need which includes a GPS and a wireless transmitter, we have the answer to virtually any application you may encounter.